This year it seems like Spring has forgotten the majority of the US. Here in Seattle we’ve haven’t had much reprieve from the rain, and sunny days mean throwing out any to-do lists in favor of enjoying the sun! 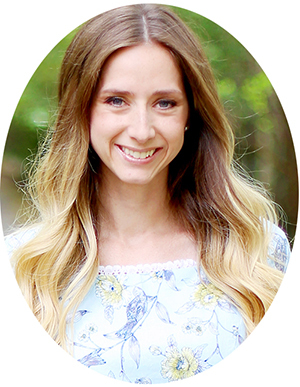 Because it’s often wet and rainy outside my window, I love to “bring Spring” any way that I can, which usually means incorporating it into my decor! If I can’t enjoy it outside, I’ll definitely enjoy it inside ;). 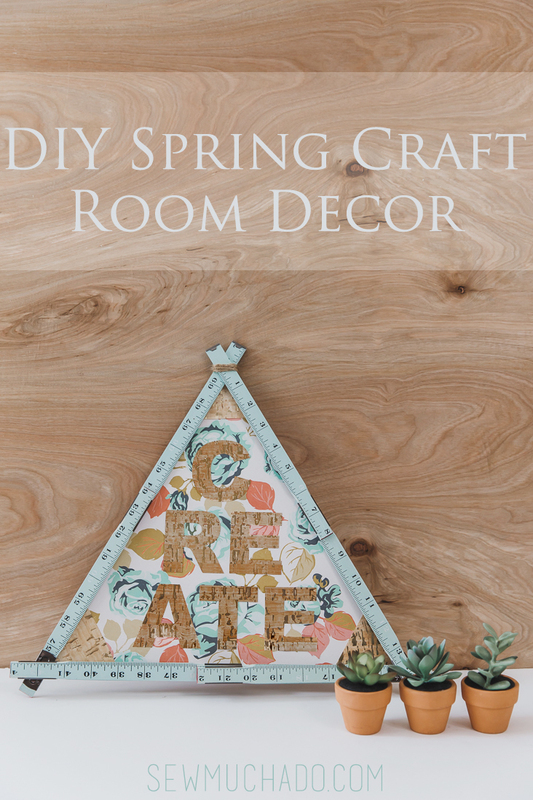 Today’s project is one that has definitely helped bring the bright and happy vibes into my life that the weather hasn’t, and I’m excited to partner with Tuesday Morning to bring you this DIY Spring Craft Room Decor Tutorial so you can make one too! And speaking of jumping into my cart, the faux cork paper was not the only item that came home with me. 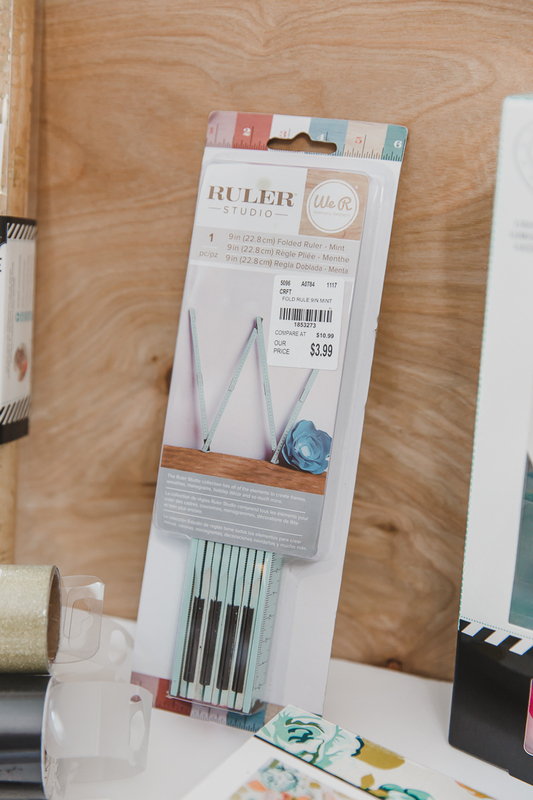 For a relatively small craft section, I was impressed with the variety of craft supplies offered, and even more impressed with the quality of brands. 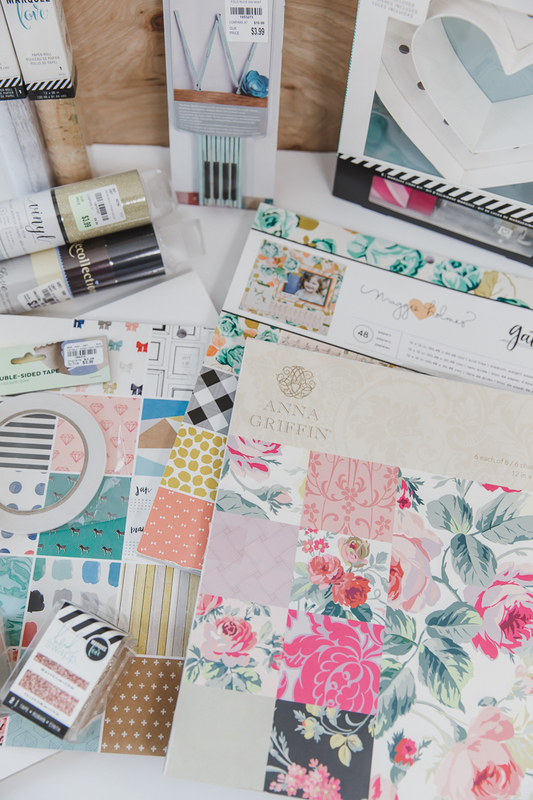 I found the most adorable scrapbook paper sets by Maggie Holmes and Anna Griffin that I’m sure you’ll be seeing more of around here soon. 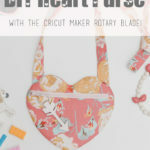 I was really excited to see the big selection of Heidi Swapp products as well. 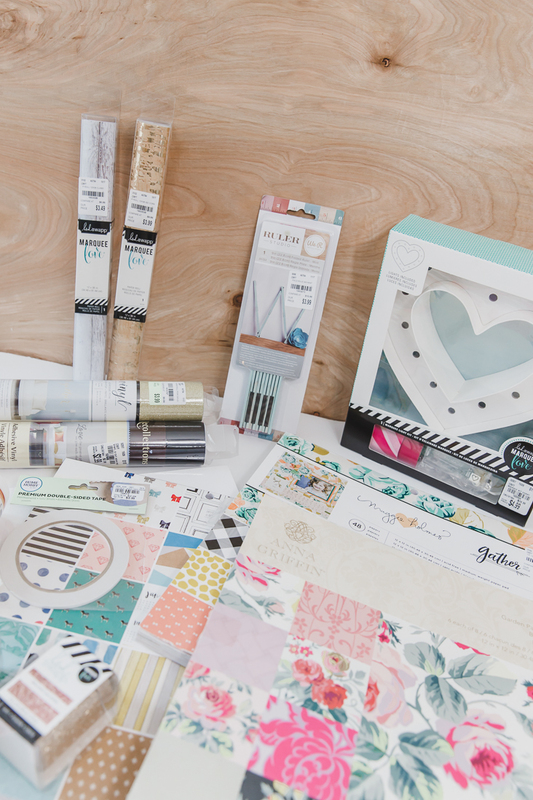 In addition to the faux cork paper, I grabbed a heart marqee, some metallic tape, and a faux wood paper roll – because how could I not? 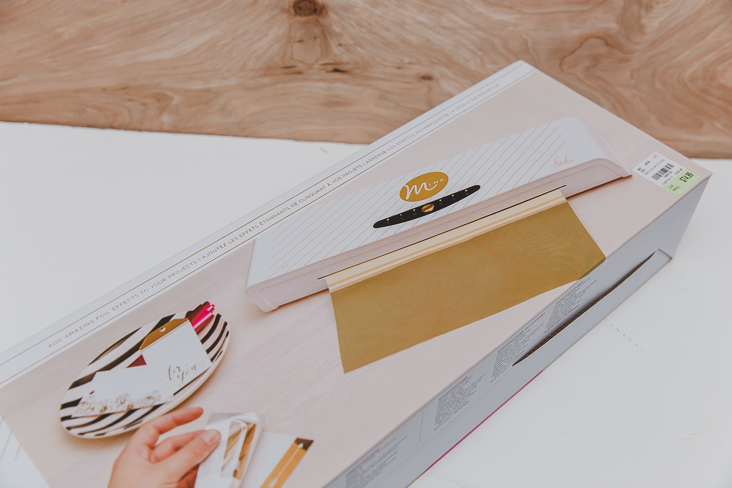 Perhaps the coolest Heidi Swapp product I brought home was a foil applicator! 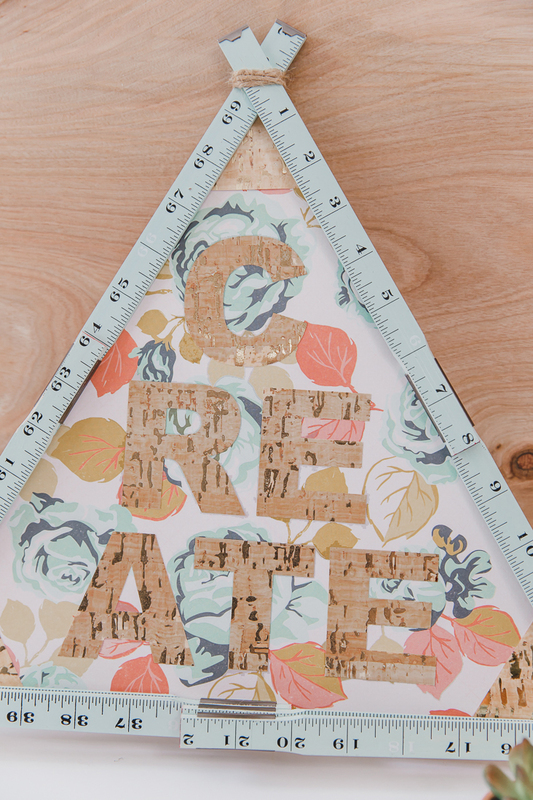 I’m already thinking of all the fun things I can make with it, and if it wasn’t for my love for the faux cork paper, it would have made it’s way onto today’s project for sure. At $74.99 (compare at $149.99), it was a steal! 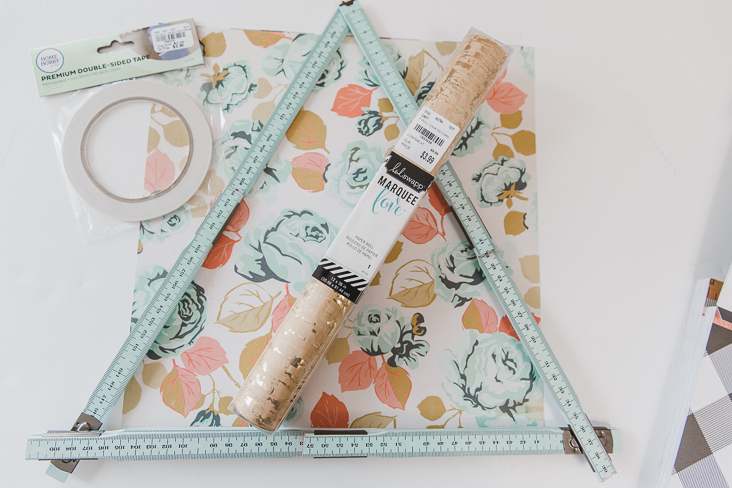 I went into the store with plans to make a Spring-inspired canvas art (they had several different sizes of blank canvases), but when I came across the American Crafts folding ruler for only $3.99 (compare at $10.99), all I knew was that I needed to use it in my project and that it would be so perfect incorporated into my sewing room. I thought it was so unique, and love that you can fold them into almost any shape, even a star or heart! I love that every trip to Tuesday Morning is a surprise and I never know what goodies I’ll find. 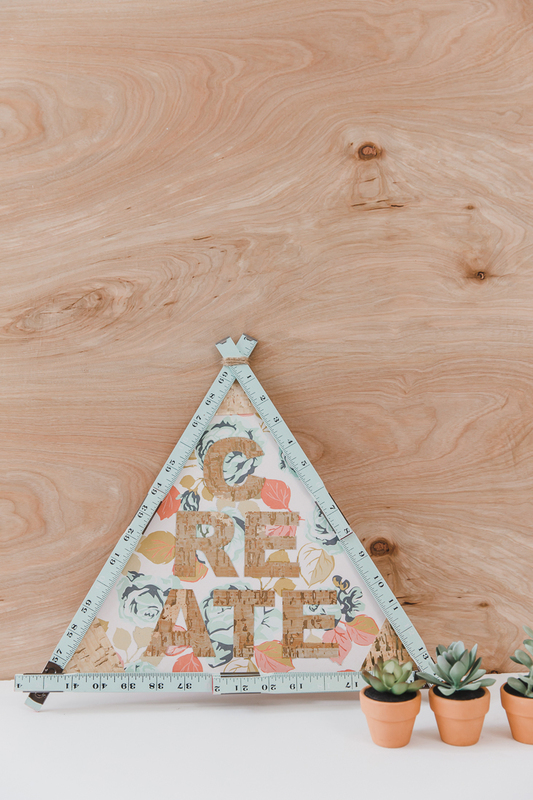 With buyers constantly scouring the world for the best products, there is always something new and interesting to get you motivated for your next craft project. Sometimes you don’t know what you need until you see it, right? 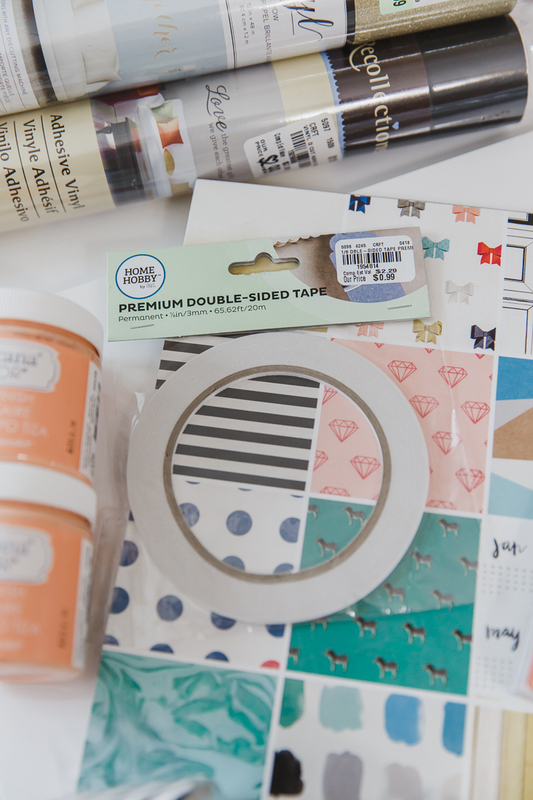 ;) I even found some double sided tape which was just what I needed for this project! 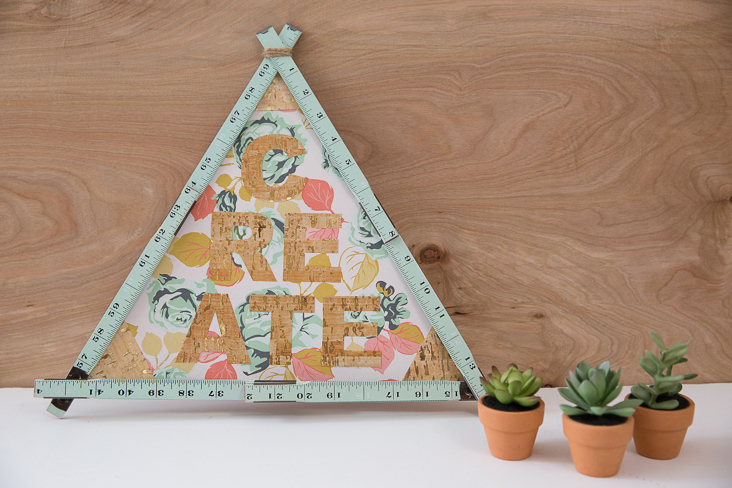 Ready to get started on our Spring Craft Room Decor? 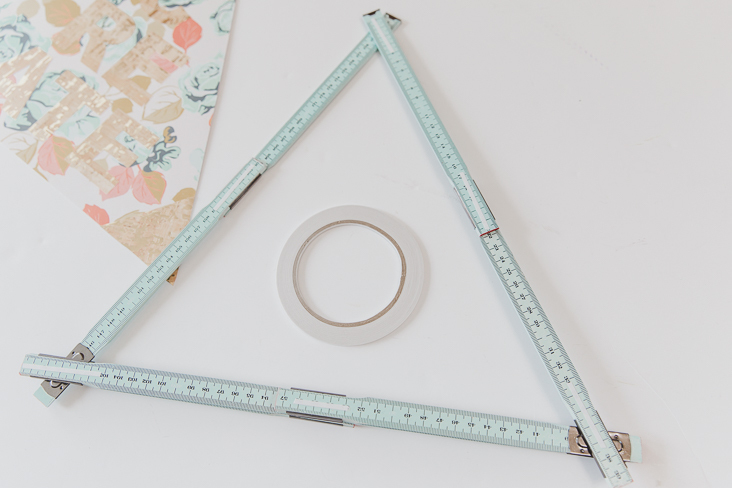 Begin by folding the ruler at each hinge to form a triangle shape. 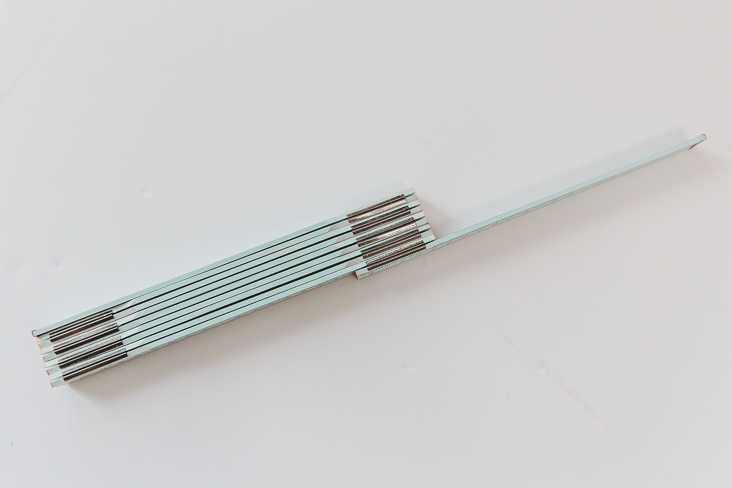 Secure two ends together at top with a small piece of double sided tape (we’ll secure this further in a later step). 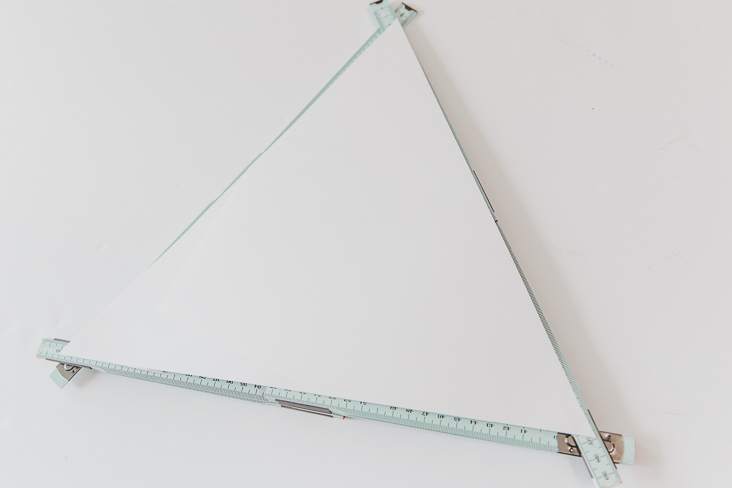 Tape two pieces of white cardstock together large enough to cover inside of ruler triangle. 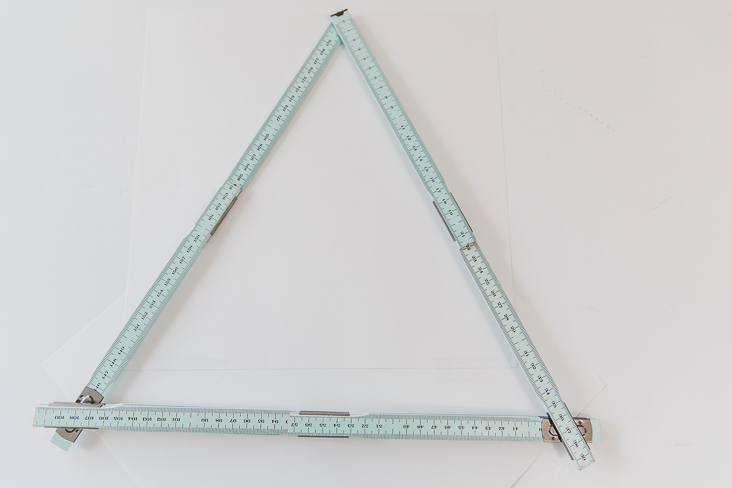 Use pencil to trace inside of triangle onto paper. 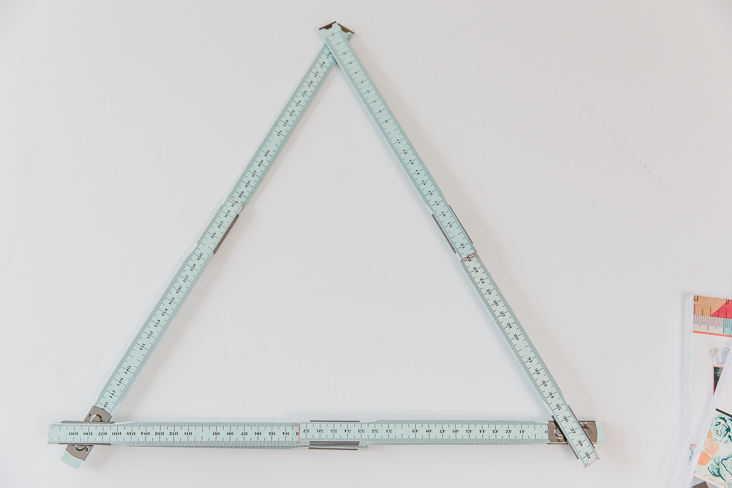 Cut 3/8″ from traced line, forming triangle. 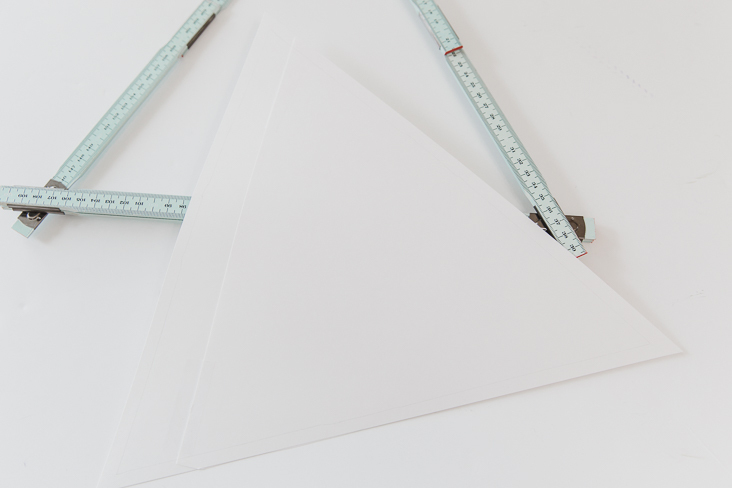 Place strip of double sided tape down center of white triangle. 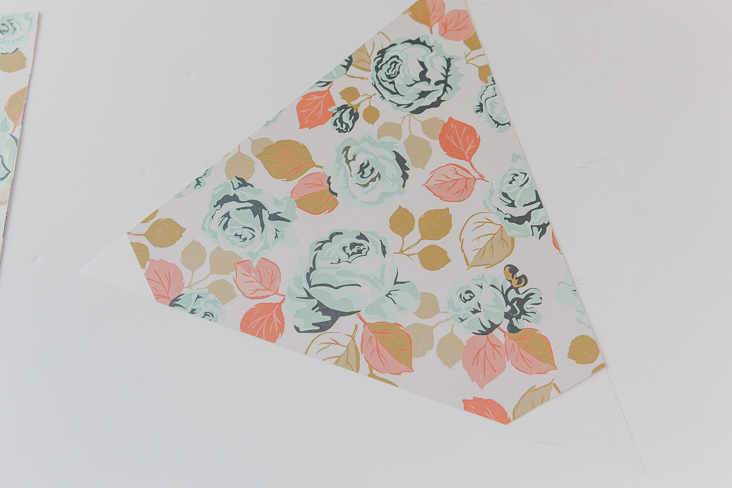 Place floral scrapbook paper over cardstock, allowing tape to secure the two together. 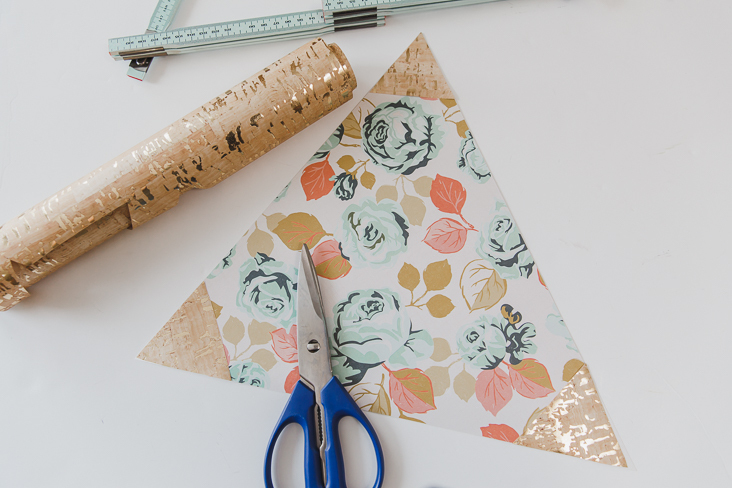 The scrapbook paper will not be large enough to cover the bottom two cardstock corners, so cut out three triangle shapes from the faux cork paper roll and use double sided tape to secure onto corners. 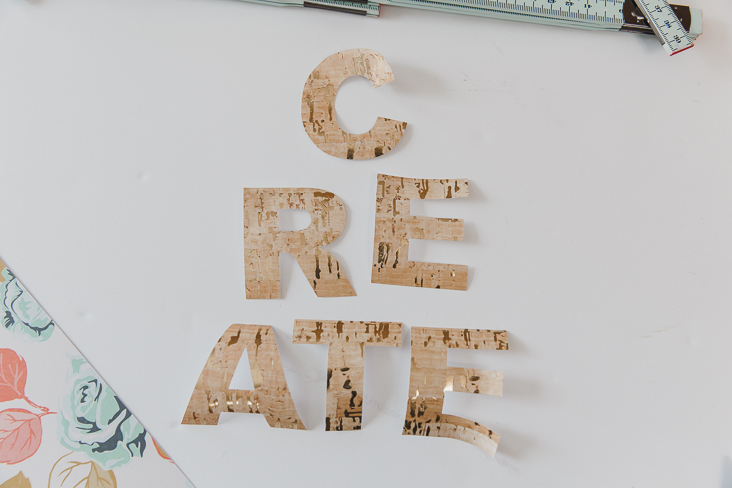 Next, cut the “CREATE” letters from the faux cork scrapbook paper. 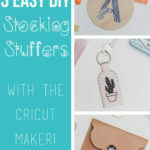 Use either a die cut machine (I used a machine I already have but found a Cricut Explore at my local Tuesday Morning if that’s something on your wishlist!) scissors/craft knife and the PDF file above to cut the letters. 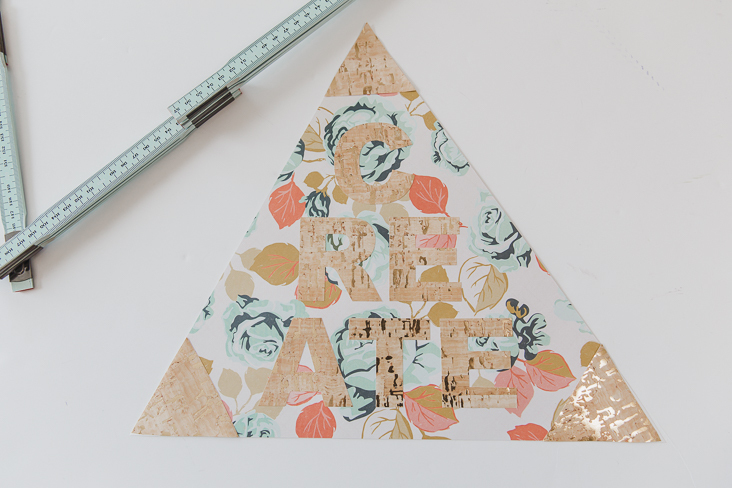 Arrange the letters over the floral paper in a triangle shape as pictured. Use glue stick to secure each letter in place. Time to secure the art to the frame! 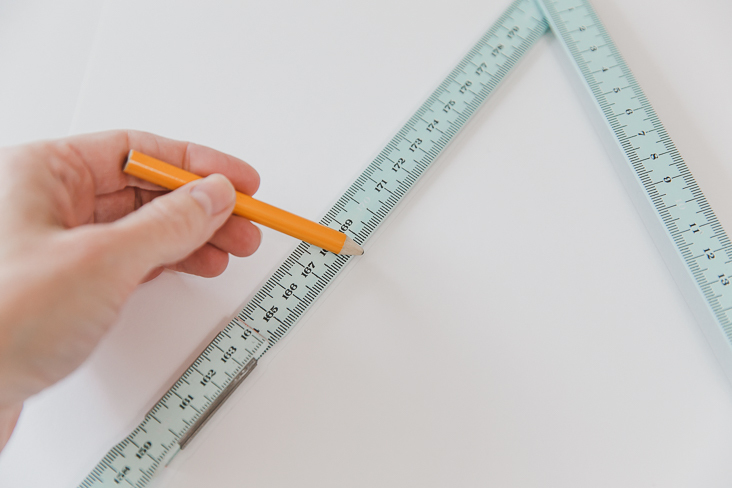 As the ruler pieces will not be flush on the backside, place a strip of double sided tape on each portion that will sit directly against the paper. Place frame over the paper and press down to secure in place! 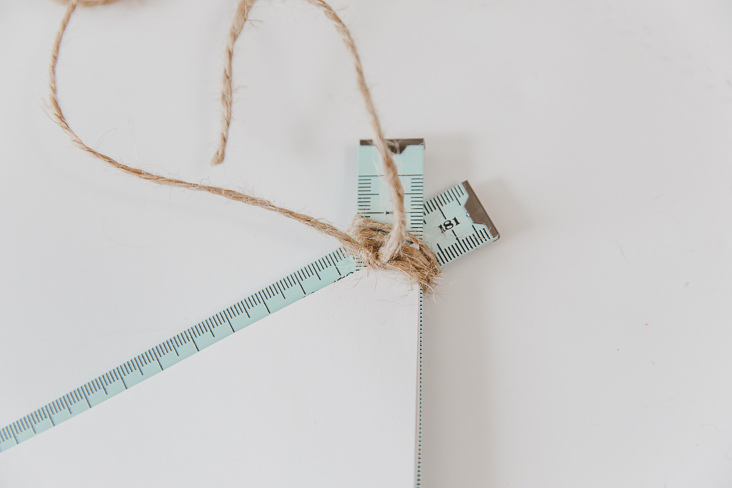 Last, wrap a piece of twine or yarn around top of ruler at intersecting point, beginning in middle of twine piece and wrapping each end around two or three times. 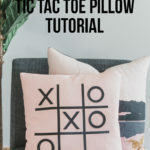 Pull each end tight and tie in a square knot on back of frame. 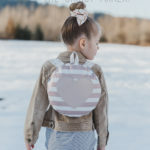 Tie a bow approximately 6″ above knot for hanging. Great job! 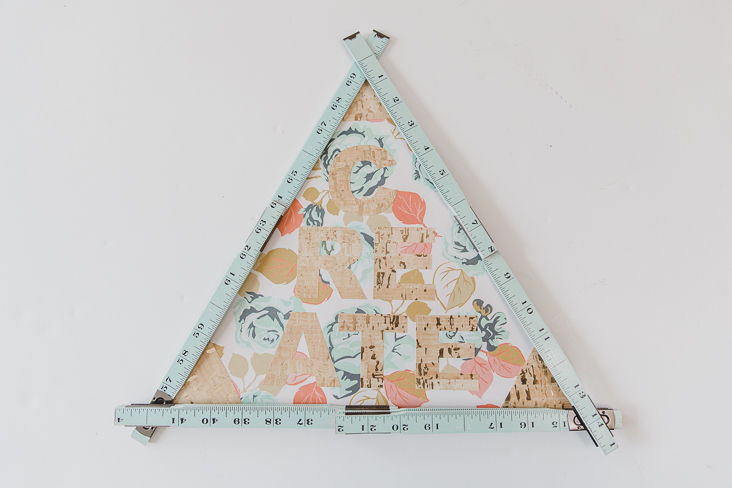 Hang your new spring craft room decor in your craft room and be inspired!